Seasons will change everything in Forza Horizon 4. From the environments and landscape to weather conditions and even race events. To highlight each of the four different seasons present in its latest open-world racer, developer Playground Games will host a series of unique livestreams that showcase everything players can look forward to across Summer, Autumn, Winter and Spring in Forza Horizon 4. The first broadcast followed the latest episode of Inside Xbox, and it focused exclusively on Summer to celebrate the current British heatwave. The livestream was hosted by Xbox On’s BennyCentral in Leamington Spa in the UK, and he was joined by Forza Horizon 4 Creative Director Ralph Fulton, Art Director Ben Penrose, Senior Game Designer Grant Orban, Senior Car Handling Designer Chris Philips, and Lead Technical Animator Harry Geoghegan. 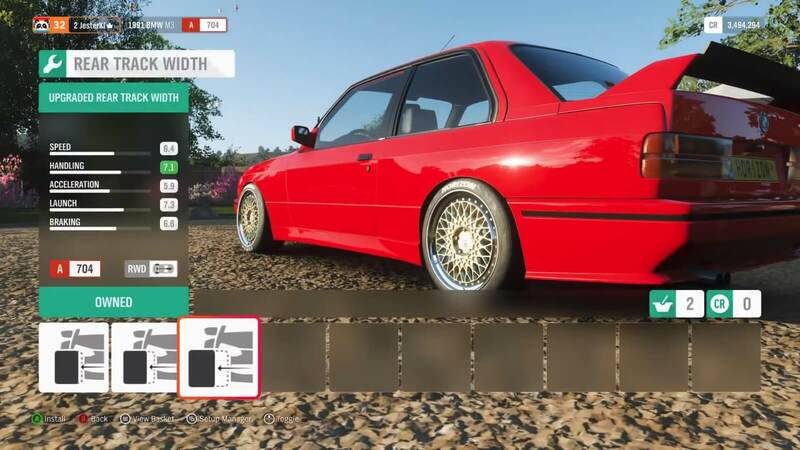 The broadcast featured around one hour of brand-new, unseen Forza Horizon 4 gameplay in the Horizon Solo freeroam experience. This meant the world was filled with Drivatars instead of actual players, but it did showcase how the overall game will function when you aren’t connected to the internet. We also had our best look yet at the game’s take on beautiful, historic Britain. Character customization was another area of focus for the livestream. There’s plenty of items to unlock here, including tops, pants, hats, gloves, shoes, outfits, wristwear, eyewear, and more. The full clothing selection can be enjoyed by both male and female characters, and there’s even a Chicken Disco outfit. Also present are emotes, including Fortnite-style dances and memes, such as the dab and floss. More than 50 will be available to choose from at launch. 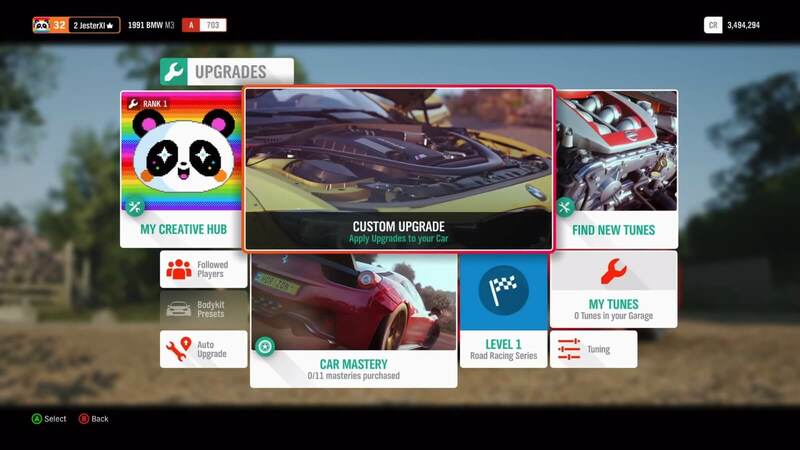 You can find a list of the customization items spotted during the broadcast over on the Forza Forums. 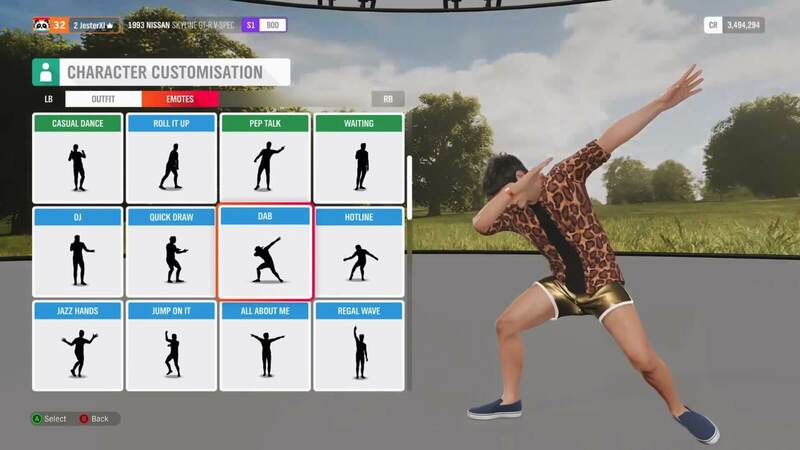 Each piece of clothing and emote available also has its own rarity level, and in terms of characters, the same set of 14 drivers from Forza Horizon 3 will make their way into Forza Horizon 4. The models have been improved, however, and can be personalized with the more than 500 items of clothing customization available in the game. 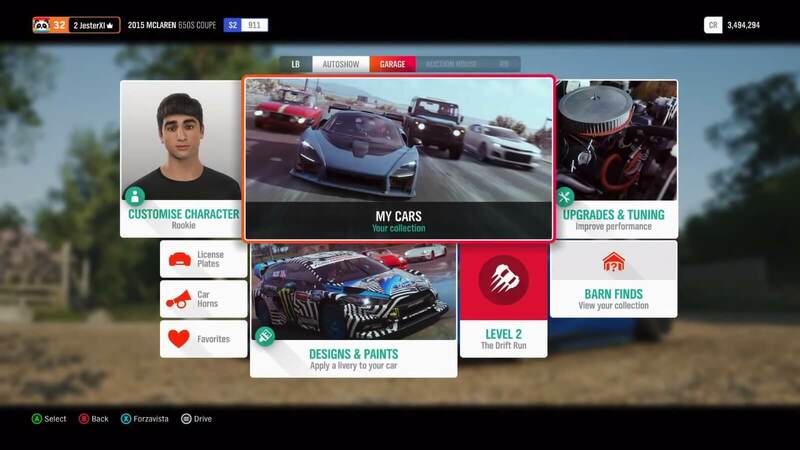 During the livestream, Playground Games also confirmed that Forza Horizon 4 will feature 12 houses to buy, with the first being rewarded to you at no cost when you begin the game. This house is called ‘The Gables,’ and it’s located in the village of Broadway in the Cotswolds. Also shown was the Sunflower Meadows home at Ambleside in the Lake District. Edinburgh Castle was confirmed to the most expensive property in the game, being a multi-million-dollar house that also unlocks a crown for your character with a royal wave emote should you manage to afford it. 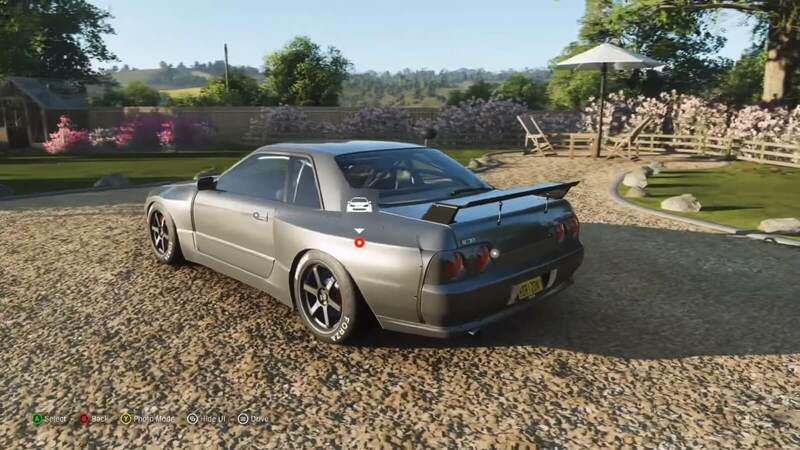 Each property in Forza Horizon 4 also comes with its own unique perks, with one allowing you to fast travel anywhere around the map. Cars were naturally also a focus of the broadcast, and here we saw a Nissan Skyline R32 adorning a Rocket Bunny kit. In fact, a decent chunk of the livestream focused on this car exploring open-world Britain. 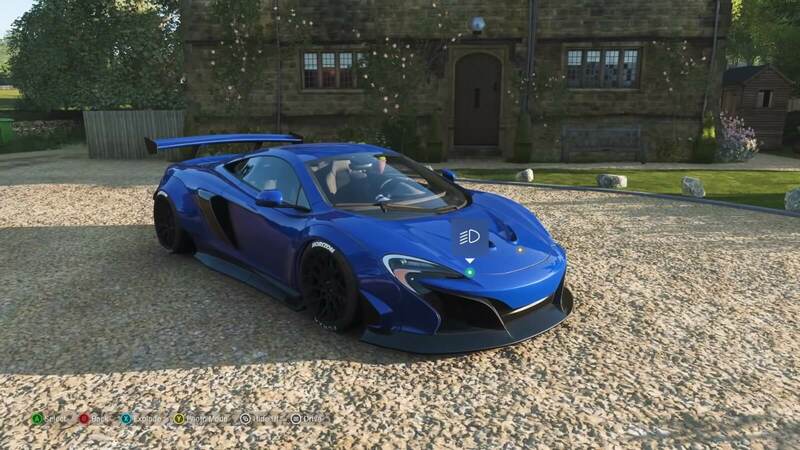 More than 30 new bodykits will also be introduced into Forza Horizon 4, and one of these were showcased on the McLaren 650S – a full Liberty Walk bodykit complimented by aggressive stance. New kits built specifically for off-roading vehicles will also be made available, whilst adjustable wheel off-sets were also revealed – with more than 150 cars confirmed to support wheel spacers at launch in Forza Horizon 4. This was showcased on the 1991 BMW M3 during the broadcast. The 2017 Ford Rahal Letterman GRC Fiesta was also on display during the livestream – which is one of the new cars making its Forza franchise debut in Forza Horizon 4. Playground Games also revealed some fresh details on the Drag Strips that will be featured in the game. These include one at an ice lake that’s only accessible in Winter, as well as one by the beach, another by an old, abandoned airfield, and of course, the quarter-mile strip at the Horizon Festival. You can learn more about the improvements being made to drifting and drag racing in Forza Horizon 4 from our previous coverage. In addition, we also saw sheep and chickens during the livestream – which will be present in fields and countryside environments around the map, but you obviously cannot run them over. Bonus Boards have also been confirmed to return, as well as the Shopping Cart upgrade system from Forza Horizon 3 and all-new ‘Car Masteries,’ which have yet to be detailed. As well as credits, players will earn ‘Influence’ from completing race events, story quests and various in-game challenges. Wheelspins also return, complimented by all-new Super Wheelspins that offer even better rewards to unlock. Next week’s Forza Horizon 4 broadcast from Playground Games will focus on Autumn. In this one, we’ll see more of the game’s shared open-world focus whilst connected online with Horizon Life. Playground Games will also debut a brand-new showcase event that Ralph Fulton teased is “just brilliant, never seen before – in almost every sense.” We’ll also a have a look at the map, which wasn’t shown in this week’s livestream due a bug present in the current development build of the game. Forza Horizon 4’s Autumn livestream will broadcast next Tuesday, July 17th at 7pm BST (11am PDT, 2pm EDT) on Mixer. You can check out the full on-demand video for the Summer livestream at the top of this article. Forza Horizon 4 will be available on October 2nd, 2018 for Xbox One and Windows 10 PC, and it’ll be available day-in-date on the Xbox Game Pass monthly subscription service. For more on Forza Horizon 4’s Seasons, be sure to check out our in-depth feature story dedicated to this unique aspect of Playground’s upcoming open-world racing game.